I stumbled through the house holding my eye, trying to get to the kitchen another time. I felt dizzier than the last time and my eyes wouldn’t stop watering. I reached into the freezer with the intention of grabbing bagged peas those always seemed to work best, but I couldn’t see which bag was which and just settled for the biggest thing I could grab. Pressing the icy bag on my face I led my way to the couch by holding onto the wall. When he left he slammed the door. I knew he would be gone for a while, drinking off my mistake a Paul’s Pub. That’s where I met Mike, my fiancé. He drove up in his brand new Nissan Titan truck. It was fire engine red, a man’s car, rugged and sleek. The normal crowd: my group from work, the local construction company owners and neighboring businessmen. None of the men, no matter how well known or wealthy, had a presence like him. The women stared while men shook his hand and offered to buy him his first beer of the night, re-capping the first thirty minutes of the Jets game. I’d always been a little shy, creeping behind my friends to get out of sight when I noticed a man staring, trying to divert their attention to a girlfriend close by. The third Friday night, this man walked in and I couldn’t help but steadily fixate my eyes on him. My friends laughed. Ignoring them, I strutted in his direction. On first date we drove about forty-five minutes to a destination secret to me, listening to his music, early 70’s classic rock and hip-hop throwbacks from the 80’s as we laughed and talked. We pulled down a dirt road in his big pick-up, I felt like I was in a country music video. We pulled up and a man in blue jeans came out with two horses. With a cute smirk, he introduced himself as Tim and the horses Remy and Sunshine. I could barely see under the shade of his John Deere trucker hat. I introduced myself to Tim with a big smile. I started to step away form the horse and fiddled with my hands at my belt. I started to feel a knot roll around in my stomach. These men expected me, a born and raised New Yorker, to climb up on that huge beast. Mike suggested I get on first. I scanned the open land for a step stool with no luck. “Okay, do you have a ladder?” I asked. I could feel heat rush up my face as I blushed. I walked up to the animal. Mike grabbed me by the waist and told me to put my foot in the stirrup. “What’s the stirrup?” I hesitated asking, taking soft deeps breaths, trying to calm the red wave of heat on my face. I stood up on one leg in the stirrup. My ankle started to shake, then my knee. My hips swiveled and my free leg kicked in the air barely missing Sunshine’s ribs. Next thing I knew I was in the arms of Mike. The two of them laughed. Three attempts and two failures later I was on Sunshine. I felt the cool breeze as I looked around from eight feet. I took a deep breath and felt completely free, proud of myself. I watched the mane bounce as the horse walked and the thin layer of hair shine with each step. I felt his rippling muscles, proved his power. After a brief lesson of how to stop turn and reverse, the horses walked into the open fields as Mike and I talked. The day turned to night, and I saw the stars like I never have before. The night ended with a late dessert and coffee back in New York and a kiss on the cheek. A few months later we were finally together. My friends were worried for me dating such an older guy. It’s true that sometimes I felt like I had another father, not a boyfriend, but not always. A new theme park opened. We couldn’t wait to check out the new rides. Mike would hold me close, gripping my thin waist when a man talked to me in line for a ride. I didn’t see the big deal. They were older men, with their families mostly. I quietly confronted Mike about it, and he aggressively reminded me that now that I live with him and that my father passed there should only be one man in my life, him. He and I were on an adrenaline high from the Scream. While Mike was in line for a couple drinks a guy along Superman came up to me. The guy asked to take my picture for the new amusement park Web site. I hugged the Spandex and felt-costumed Superman and posed just as Mike came back. He dropped the Cokes and pulled Superman away from me just as the camera flashed. He stomped towards the camera guy, grabbing for his shirt, threatening him to stay away if he wants to stay breathing and pushed him right into me. He turned and looked for Superman but he had already run off. He squeezed my wrist and stomped off, dragging behind. We found a bench away from the crowd. I looked at Mike puzzled and started to explain. He interrupted me holding me tight rocking me like a child. He grabbed each shoulder and extended his arms in front of him, giving me a taste of what whiplash is like. His eyebrows lowered and a worm of a vein started to wiggle out his left sideburn to the middle of his forehead. His nostrils flared slightly, and he pinched his lips together tight to a wrinkly dehydrated looking surface. He gripped me tighter. My stomach spun, and I lost my breath. For the next thirty minutes, we argued about how I was disrespectful and ignorant. That was six months ago. The first time he hit me he was mad because I came home late from girl’s night. Next thing I know I’m buying concealer at the local drugstore at one in the morning. Of course I was escorted by him, with huge sunglasses on to hide my ugly purple marks. The second time we were arguing about my promotion at work. I came home excited but Mike wouldn’t have me working. He said women should work in the home, taking care of their man. We don’t have any kids, the house was always clean, dinner started at six every night and I do it with a job. I didn’t see the big deal. He just wouldn’t have that so he figured throwing me into a wall would be a good solution to shut me up. A few weeks later I was forced to resign my position due to multiple sick-day absences. Here I was working at home, all I did was clean and watch TV. Then I set an alarm to get me up to start dinner, every afternoon at five. This afternoon Mike came home early around three while I was in the middle of vacuuming. He criticized the crisscrossed suction lines in the carpet, saying I was doing a sloppy job. He watched me as I did it over. Then he grabbed a small glass and his favorite rum and went to our bedroom. I hated that room. I hated the walls staring back at me. I hated looking at that ceiling. I hated the smell of the new carpet every time I walked in. I hated the cleanliness I was forced to keep up with. In that room I got the call that my father died. The first time Mike hit me was in that room. The first time he violently threw a bottle at me was in that room. When I realized I was trapped, without a family, jobless, hopeless, faithless, helpless, I was in that room. I finished dinner and called Mike from the bedroom when I walked in the smell of Zest in a steamy shower filled my nose, and Polo cologne floated through the air. Mike was combing his hair in the mirror cockily smirking at like always. Then he saw me in the reflection. “Hey get my shirt.” He yelled over the Rolling Stones greatest hits. I knew this would be bad. I panicked. My heart started to beat and my breathing got heavy. I knew I needed to find a replacement in a hurry. I grabbed the first starched up shirt I could find, pale blue, his usual. That face again, the worm, the bowing eyebrows the parched lips, that look, enough to make me want to drop dead, that look that made me feel like a little kid again, vulnerable and in danger. I wanted to get out. Run. Get away. I was out of concealer and out of ice. He hit me with a closed fist. I can’t even remember him walking up to me. I know my body hit the wall and I woke up not able to see. I listened and couldn’t hear him. It didn’t make any sense. Each time he hit me the conversations were shorter. The reasons seemed less important then the time before, but with every hit, he hit harder. I stumbled through the house holding my eye, trying to get to the kitchen another time. I felt dizzier then the last time and couldn’t quite pinpoint the pain. My whole left half of my head bubbled to double the size. It seemed a numb feeling ran through my lips. My eyes dripped with hot tears and my nose was sensitive to any pressure. My cheek bone felt as if protruded out of my skin, but like always no blood. I’m sure just more purple skin. I reached into the freezer with the intention of grabbing bagged peas those always seem to work best, but I couldn’t tell which bag was which and just settled for the biggest thing I could grab. Leading my way by holding onto the wall, I swayed to the couch pressing the icy bag on my face. A splintering rush of cold needles pricked into my skin, only making my swelling feel worse. He left in a hurry with a slam of the door so I knew he would be gone for a while drinking at Paul’s Pub. Now I’ve got time to get out! Copyright 2008, Rosemary Landano. © This work is protected under the U.S. copyright laws. It may not be reproduced, reprinted, reused, or altered without the expressed written permission of the author. 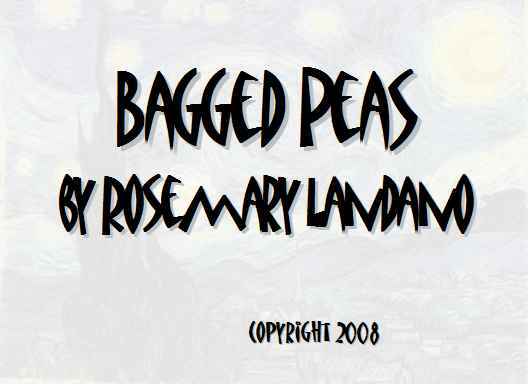 Rosemary Landano is a Literature major at the University of Bridgeport beginning her Senior year in the Fall of 2008. She has been honored as an NCAA All-American Scholar Athlete, an NFCA All-American Scholar Athlete, and at the University of Bridgeport she is the Women’s Softball Scholar Athlete Representative. Her work has been published recently in Groundswell.